Three pandemics of bubonic plague have occurred in historical times: the first began with Plague of Justinian from AD 541 to 544, continuing intermittently until AD 750 AD; the second began with the Black Death from AD 1347 to 1351, continuing in waves including the Plague of 1665-66 into the eighteenth century; and the third which started in China in the mid-nineteenth century and triggered a series of outbreaks worldwide during the first half of the last century. The Black Death alone killed 30 to 50 percent of the European population. Deaths totalled at least 75 million, more than the number of deaths during World War I and II combined. The cause of this deadly disease was identified as the flea-borne bacterium Yersinia pestis in 1894 by Swiss biologist Alexandre Yersin. More recently, genetic studies have suggested that it diverged from the more widespread but less virulent Yersinia pseudotuberculosis anywhere between 2,600 and 28,000 years ago. In a newly-published study, researchers investigated the origins of Y. pestis by sequencing ancient bacterial genomes obtained from the teeth of Bronze Age people across Eurasia dating from 2,800 to 5,000 years ago. Their findings indicate that the flea-borne strain that caused the historic period plague pandemics evolved from a less virulent strain that was present in human populations long before any records of plague outbreaks. The strains infecting Bronze Age Eurasian populations lacked the Yersinia murine toxin (ymt) gene, which encodes a phospholipase D protecting the bacterium inside the flea gut, so enabling fleas to act as vectors. Similarly, mutations associated with the development of bubonic plague and evading mammalian immune systems had not yet occurred. Not until around 3,000 years ago did highly virulent, flea-borne strains emerge. The researchers also estimated the divergence from Y. pseudotuberculosis at 55,000 years ago, twice as early as previous maximum estimates. The Bronze Age strains began to diverge from one another 5,800 years ago. Although they could not cause bubonic plague, they could still cause pneumonic and septicemic plague and these might have been responsible for population declines between the late fourth and early third millennium BC. Large scale population movements and social changes during the Bronze Age might have facilitated plague outbreaks, but not on the scale of the historical era flea-borne pandemics. Rasmussen, S., Allentoft, M., Nielsen, K., Orlando, L. & Sikora, M., Early Divergent Strains of Yersinia pestis in Eurasia 5,000 Years Ago. Cell 163, 571-582 (2015). The familiar terms “Stone Age”, “Bronze Age” and “Iron Age” are part of the so-called Three Age system, introduced by the Danish archaeologist Christian Jurgensen Thomsen in 1819 when he was curator of the collection of antiquities that subsequently became the National Museum of Denmark in Copenhagen. Thomsen was looking for a simple and logical system by which to arrange the collection which in common with those of other museums was in a chaotic state, overrun with prehistoric artefacts from all over the world. Thomsen was not the first to think of applying tool-making materials as a basis for classifying prehistoric cultures, although he was the first to actually do so. Thomsen lacked any means of dating his artefacts, but correctly guessed that stone had preceded bronze, which in turn had preceded iron. At the time – forty years before Darwin’s Origin of the Species – few suspected the true antiquity of mankind, with many still believing that the Earth was just 6,000 years old. Although the Scottish geologist Charles Hutton and others had begun to call this figure into question, in the early 19th Century it was still widely accepted. As far back as 1860s, Thomsen’s original scheme was beginning to look lopsided and in 1865 the archaeologist Sir John Lubbock, a friend of Charles Darwin, published Pre-historic Times, which was probably the most influential archaeological textbook of the 19th Century. 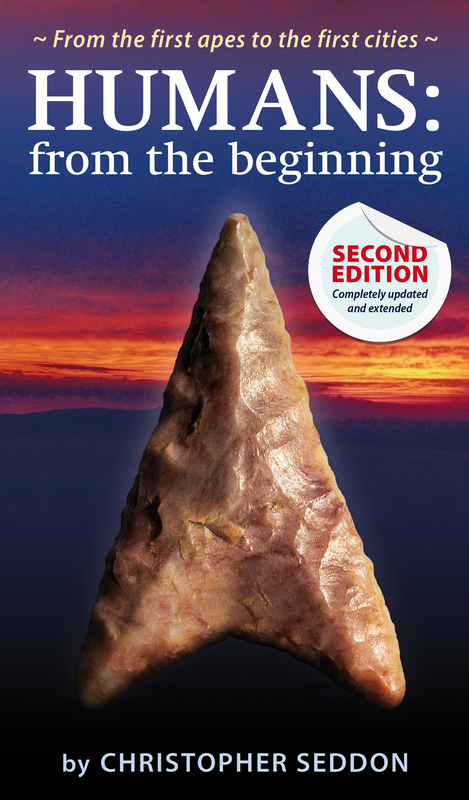 In it he introduced the terms “Palaeolithic” (Old Stone Age) and “Neolithic” (New Stone Age). We now know that the Palaeolithic encompasses all but a tiny fraction of human prehistory, beginning approximately 2.5 million years ago with the emergence of the first members of Genus Homo – i.e. the first human beings. Accordingly the Palaeolithic is in turn divided into Lower, Middle and Upper. The Lower/Middle transition is taken to be the point at which Mode 3 industries enter the archaeological record such as the predominantly Neanderthal Mousterian culture, at very roughly 300,000 years ago. The Middle/Upper transition, approximately 40,000 years ago, is the point at which unequivocal evidence for modern human behaviour is found. In Africa the terms Early, Middle and Late Stone Age, or ESA, MSA and LSA respectively, are preferred, but the LSA also encompasses the Neolithic and Bronze Age as neither metallurgy nor agriculture reached sub-Saharan Africa until Iron Age times. To avoid confusion, I shall use only the term “Palaeolithic”, with its sub-divisions occurring at different times in different parts of the world. Such a scheme is generally used for later prehistory and I see no reason not to use it here also. The division between the Palaeolithic and the Neolithic is now taken to be the Pleistocene/Holocene boundary, that is to say the end of the last ice age, at around 11,550 years ago. This is somewhat illogical division, equating a purely geological change to a system based on technology. Agriculture was independently adopted in several parts of the world and spread outwards from these nuclear zones, taking many millennia to reach some places, and necessitating the introduction of another division, the Mesolithic (Middle Stone Age) for regions where hunter gathering persisted. Conversely in parts of the world where proto-agriculture was practiced in late Pleistocene times, such as the Levant, the term Epipalaeolithic is used. The transition from Neolithic to Bronze Age is equally ill-defined – there is generally a transitional period where stone and native copper tools are in mixed use; this transitional period is referred to variously as Chalcolithic, Eneolithic or simply Copper Age. This transition began at different times in different parts of the world, and was of different duration – the Copper Age began earlier in the Middle East, but in Europe the transition to the fully-fledged Bronze Age was more rapid. The working of iron begins around 1200 BC in India, the Middle East and Greece, but again took time to spread to other parts of the world. The Iron Age continues on into historical times, not ending in Northern Europe until the Middle Ages. 2.4m YA. Earliest true humans appear in Africa, though apparently sympatric with later “robust” australopithecines (Paranthropus). Now believed that early fossil hominids represent at least two synchronous (though not sympatric) human species, Homo habilis (brain size 590-690 cc) and Homo rudolfensis (750 cc). It is not known which if either was ancestral to later types. Tools: Mode 1 Oldowan (2.4m – 1.5 m YA) flakes and choppers. Mode 2 Acheulian (1.4m – 100,000 YA) handaxes and cleavers. 1.9m YA. Homo ergaster (brain size 700-850 cc) appears in Africa; migrates to Far East; migrants now widely regarded as becoming a separate species, Homo erectus (orig. both classed as erectus). 500,000 YA (poss. as early as 1.0m YA). Use of fire. 800,000 YA. Homo Antecessor. Controversial taxon known only from Atapuerca in Northern Spain, believed by some to be the common ancestor of both modern man and the Neanderthals. 500,000 YA. Larger-brained (1,200 cc) and bigger-boned hominids are found in the fossil record in Africa, Asia and Europe. Traditionally referred to as “archaic Homo sapiens” but Homo heidelbergensis now favoured. Other types have been proposed such as Homo rhodesiensis and H. helmei. It’s all very confusing! 250,000 YA. Homo neanderthalensis “the Neanderthals” appear in Europe, possibly descended from Homo heidelbergensis. They later spread to the Middle East. 250,000 – 35,000 YA. Mousterian culture in Europe. Tools: Mode 3. (from 200,000 YA) flaking of prepared cores. Increasing use of the Levallois method to prepare cores, though this method was also used in late Acheulian times. 160,000 YA. Earliest near-anatomically modern humans, Homo sapiens idaltu, Herto, Ethiopia. 150,000 YA. Birth of putative “mitochondrial Eve” in East Africa. 100,000 YA. Homo sapiens in Israel (Skhul and Qafzeh). 50-60,000 YA. H. sapiens in Australia (Lake Mungo). 43,000 YA. H. sapiens reach Europe. Tools: Mode 4 (narrow blades struck from prepared cores). 35-29,000 YA. Châtelperronian culture, central and south-western France, final phase of Neanderthal industry. 34-23,000 YA. Aurignacian culture in Europe and south-west Asia. 32,000 YA. Chauvet-Pont-d’Arc cave paintings, southern France. 28,000 YA. Last Neanderthals die out. 28-22,000 YA. Gravettian culture, Dordogne, France. “Venus” figurines. 21-17,000 YA. Solutrean culture, France and Spain. 20-18,000 YA. Last Glacial Maximum (LGM), maximum glacier extent of last Ice Age. 16,500 YA. Lascaux cave paintings, Dordogne, France. 15-11,600 YA. Magdelanian culture in western Europe, final European Palaeolithic culture. 12,900 YA. Beginning of the Younger Dryas stadial. 12,000 YA. Jōmon culture in Japan, first use of pottery. Natufian culture (14,000-11,600 YA) in the Levant. 11,600 YA. Last Ice Age ends. 11.6-6,000 YA. Hunter-gathering persists in many parts of the world. 11,600 YA. Rapid transition to agriculture in Middle East and Anatolia. 9,200 YA Catalhoyuk – very large Neolithic settlement in Anatolia. 9,000 YA. Beginning of the “Wave of Advance” – expansion of proto Indo-European farmers from Anatolia. 9,500 YA. Çatal Höyük, Anatolia, apparently no more than a very large village. 8,500 YA. As sea levels rise, Britain becomes an island. Copper and stone tools in mixed use. 6,500 – 3,500 YA. The age of the great megaliths in Europe. 5,100 – 4,000 YA. Construction of Stonehenge. 4,500 YA. Construction of the pyramids in Egypt. 5,300-2,700 YA. Indus Valley civilization, India. 4,700-3,450 YA. Minoan civilization, Crete. 3,600-2,100 YA. Mycenaean civilization, Greece. 2,200 YA. Mediterranean Bronze Age collapse. 1800 BC. First working of iron, in India. 450 BC. La Tene culture. AD 43. Romans invade and conquer Britain. Within Class Mammalia (the mammals) humans are grouped with apes, monkeys and prosimians (lemurs, lorises, etc) within the order Primates. The term is due to Linnaeus, representing his view that humanity sat firmly at the top of creation’s tree (the self-styled Prince of Botany was also responsible for the term “mammal”, reflecting his now quite fashionable views about breast-feeding). The majority of the 200 or so living species of primate are tropical or subtropical, living in rainforests. Most are arboreal (tree-dwelling) or at least spending much of their time in the trees. Even those that have forsaken this habit show arboreal adaptations in their ancestry. These include manipulative hands and often feet, with opposable thumbs and big toes; replacement of claws with nails; a reduced sense of smell and enhanced sight including colour and stereoscopic vision; locomotion based heavily on hind limbs and a common adoption of an upright posture; and finally a tendency for larger brains than comparably-sized mammals of other orders. The anthropoids or simians (Suborder Anthropoidea) basically comprise the more human-like primates and include Old World monkeys, New World monkeys (including marmosets and tamarins), apes and finally humans. Other primates are traditionally lumped together as prosimians. Historically, membership of Family Hominidae was restricted to humans and australopithecines, with the Great Apes being banished to a separate family, Pongidae. Both families were grouped with the gibbons, etc. in Superfamily Hominoidea (the Hominoids). However this scheme is now known to be incorrect as chimps and gorillas are more closely related to humans than they are to orang-utans. Accordingly Pongidae is now “sunk” into Hominidae (it would also be incorrect to give the orang-utans their own family). The term “hominin” (from Tribe Hominini) is now gaining popularity, because it comprises humans and australopithecines, i.e. the “traditional” hominids. The term “hominine” (from Subfamily Homininae) is also sometimes encountered; this grouping adds gorillas and chimps, but not orang-utans. To get back to the original meaning of “hominid” and subtract the chimps we have to go down to the level of Subtribe Hominina. To my mind this is very confusing and pushing the envelope of what we can reasonably ask from Linnaean taxonomy, which is after all firmly rooted in Platonic Realism (Linnaeus was a creationist), rather than Darwinian principles. I see nothing wrong with the use of the term “hominid” so long as we are aware that it includes our cousins, the Great Apes.